On the occasion of the first edition of the EVE Program in Africa which will take place in Dakar from December 12th to 14th, we organized a Twitter Chat on thursday, October 26th on: “Women’s leadership in Africa: an engine for future growth?” a real issue in Africa since this continent has one of the youngest populations in the world and is set to be a powerful economy in the future. What were the objectives of this Twitter Chat? Which experts were leading this debate? Incidentally, what is a Twitter chat? To refresh your memories, it’s a debate organized on a specific theme, during which participants answer questions from a moderator (EVE Program) using a predefined hashtag (#EVE2017). EVE Program followers (that’s you), can join in with the conversation by asking questions or answering the guests. 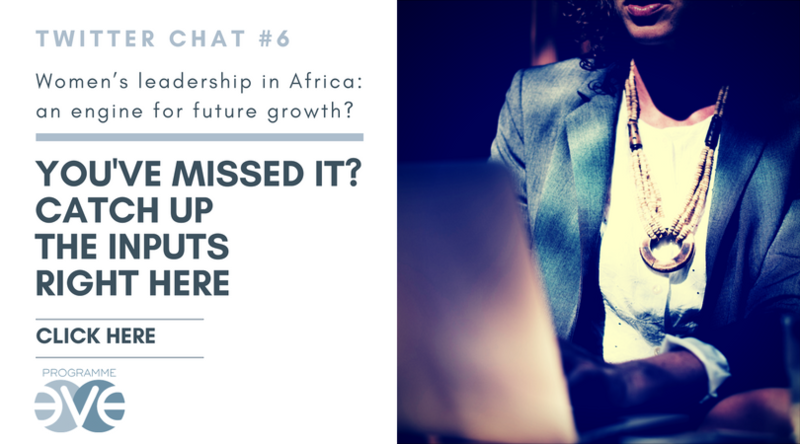 To take a look at the latest Twitter Chats on the themes of the glass ceiling and mentoring, see the Storify feeds by clicking here.